£500 refundable deposit secures the campervan of your dreams. Passionate pioneers in the design and build of innovative, super-efficient, environmentally friendly campervans, we offer a vast wealth of engineering experience and technical expertise. At Eco Campers we love to help create exciting travel adventures. We work closely with our customers to deliver unique, cost-effective campervans to your own spec. Whatever your needs – recreational, lifestyle, special interests, family or even work – we craft with imagination, experience and care to create your dream campervan and begin your adventures on the road. At Eco Campers we want you to enjoy your adventures in style, with the latest engineering technologies, comfortable ergonomic living spaces and state-of-the-art innovations that don’t cost the earth – literally. There is nothing like the open road. Nothing like leaving behind the city for an adventure full of possibility – big skies, mountains, forest, wilderness, the sea. Taking off with everything you need right there with you in the rear-view mirror. No hotels required, no accommodation needed, no restaurants to book. Just you, your co-pilot(s), the dog and the road unravelling before you. There’s a special kind of happy in that. Pioneers of the world's first generation of environmentally friendly campervans, we want everyone to tread lightly. We offer the world’s first fully hybrid and tribrid four-wheel drive vans that can go off-road to remote places with unrivalled fuel economy. We’ve got everything you need to make your adventure memorable, not to mention comfortable and economical too. Our new hybrid and tribrid technology removes the need for gas or 240v hook-up, with power inside fully supplied. Charge up your devices, from iPads to laptops and smart phones with convenient USB points, and stay warm and snug with the optional space/night heating system. Super-fast induction hobs for use inside or out with our special omni-slide cooking facility mean you can cook whatever the weather. And en-route cooking is possible too, with slow-cookers and soup makers providing a ready, home-cooked meal when you arrive at your special spot. Tea and coffee is a breeze or you can heat up something from home in the microwave. The living space is generous with smartly configured interiors that magically adapt into comfortable sleeping spaces thanks to the Vari-Track bed – a wider-than-usual bed secured on rails, that can be safely positioned along the campervan to ensure plenty of boot to the back or leg room to the front. There are a myriad of intelligent storage solutions, modular furniture options, and of course panoramic windows front and side for plenty of light and stunning views. Our Eco Hybrid offers a fantastic 43mpg using Toyota's renowned Synergy Drive technology. The groundbreaking Eco Tribrid is the world’s first tri-power campervan offering the equivalent of 80mpg. Eco Campers introduces the latest in LPG (liquid petroleum gas, aka Autogas) technology to create safe and efficient natural gas power that works alongside the petrol and electric power options, offering the world’s most economical and green campervan. Unlike purely electric cars with restricted ranges, the Eco Tribrid can last up to 900 miles without refuelling and provide extra power on motorways or in challenging environments. 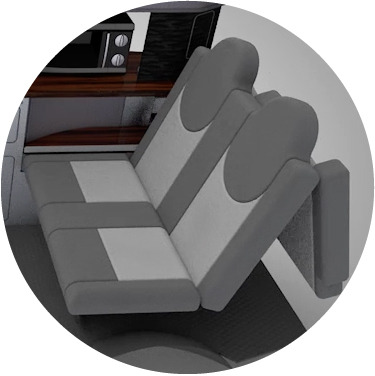 We combine ergonomic design with economically efficient, environmentally friendly engineering – here’s how it works. The Toyota Eco range has automatic four-wheel drive (4WD) as standard, allowing you to take your campervan places that others cannot dare. It switches from two to four-wheel drive depending on driving conditions. When driving normally on a road, only the front wheels are driven, giving maximum economy. But if you experience wheel slip or you want extra acceleration, then the four-wheel drive kicks in, switching off again when back to normal road or driving conditions. This seamless function allows you to drive safely and with confidence across a range of conditions, on or off-road. Hybrid vehicles use electric motors to power the wheels when driving and recharge the battery when braking. Not only does this technology recycle otherwise lost energy, it uses less petrol and emits fewer gases and crucially, less carbon monoxide – so much better for the environment. Our Eco Range also uses electric power in town, helping to keeping cities free from smog and pollution. The Tribrid, with its LPG option, is even greener, emitting fewer toxic gases than petrol or diesel. LPG, also known as Autogas, is not only cleaner, it is also currently half the price of the other two fuels, offering range and exceptional economy that outperforms any campervan on the market. The Toyota Eco range has automatic four-wheel drive as standard allowing you to take your campervan places that others cannot go. All combined, Eco Campers’ Hybrid and the Tribrid are not just the most versatile campervans on the market, but the most efficient and eco-friendly. These pioneering vans offer supreme comfort, off-grid electric cooking, modular furniture and storage options, and unbeatable economy, all powered by engineering designed with the environment in mind. As well as the on-board vehicle heating and aircon front and back, you can have an optional space and night heater fitted. These Webasto heaters are thermostatically controlled allowing for low cost and safe heating day or night. All our campervans cook using hybrid battery power. This means there is no need for gas or gas appliances – cook instead on a superfast induction hob. The hybrid batteries charge themselves from the low-emissions petrol engine, which means safe, high-induction cooking. Instead of direct heat the induction hob creates an electro-magnetic field that heats the pan, not the hob. And handily, the hob slides out for cooking outdoors by your picnic table or inside when it’s cooler or dark. And for tea lovers, a pint of water can boil in around three minutes. Our exclusive, fabulously comfortable bed offers a variable position track system. This unique technology allows you to move the ‘rock and roll’ bed from front to rear to allow for greater boot or front floor space, depending on your needs, and fast-release bolts are available at extra cost. Swivel front seats turn the space in the middle into a communal living and dining space. Choose from one or both front seats being able to swivel, or with only the passengers seat swivelling, have extra long units (including a dry cupboard) or a toilet unit behind the drivers seat. When you buy one of our campervans, we want to help you take care of it so your van will serve you long and well and in optimum condition. 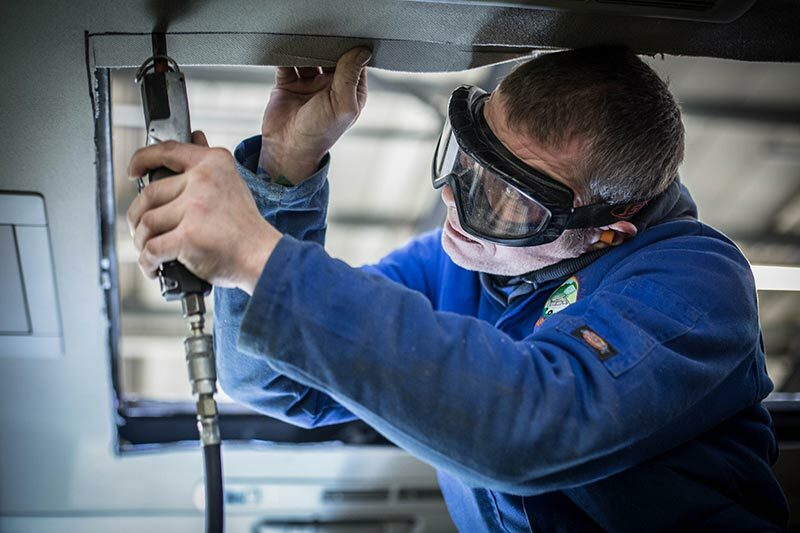 We like to look on our vans as our babies, so we commit to each and every customer for the long term, ensuring you receive the best in aftercare service, from a two-year warranty, to a free six-month check up to MOT testing and servicing. And we are always on the end of the phone for you, whatever advice you need or questions you might have. We offer as standard a full years mechanical warranty on the base vehicle plus two years warranty on all our conversion work and fitted appliances. We offer an unbeatable five years warranty on the Hybrid battery (conditions such as ensuring the battery is not over-heated and left standing without charge for periods of inactivity apply). Our skilled servicing team also offer continued servicing support on all aspects of the Hybrid components after this period. Eco Campers provide a two-year warranty as standard on all conversion parts, including all the units, electrics, heaters, bed and appliances. As Scotland’s leading Japanese import experts, our certified engineers have configured the power management and interiors of all our Eco Campers and can advise on any issues you may have. All our vans undergo a Gold Standard 42-point service check and we offer a free six-month check-up. We highly recommend winter checks and can undertake any necessary repairs including appliance testing, roof repairs, ‘rock-and-roll’ bed safety and undersealing and power supply compliance. We can provide for all of your servicing and MOT requirements; servicing starts from £234 and MOTs from £55. We stock a wide range of campervan parts and accessories. We also offer discounts for 12 months on many accessories and due to the increased storage space and ergonomic design of the interior and cooking facilities, there are so many kitchen appliance options that we can consider. You want a popcorn maker? A cocktail cabinet? A bike rack? You got it. Every campervanner is unique, with their own interests, needs and adventures in mind. That’s why we make it easy for you to tailor your van exactly the way you want it. Our skilled team design and build each Eco Camper to the highest standards, using the best products and cutting-edge appliances. We tailor each conversion to your own specifications, keeping in mind how you want to use your van. We offer packages for hillwalkers, canoeists, cyclists, families, and retirees to name just a few groups who love our vans, by offering dry spaces, portable toilets, rack[s] and storage for bikes, canoes and kayaks or other outdoor equipment. 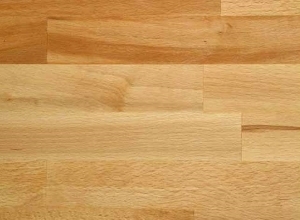 You can also detail the type and colour of fabric and request finishes that cater for heavy wear or just the family pet. Depending on the season, conversion build times vary from five to seven months. You can now hire the world's first Hybrid Eco Camper exclusively from Campers Scotland. Hire the Eco Camper for four people from three up to 28 days. Hire starts from £60 a day. Click here to book.